Vasilissa, the good heroine of a Russian fairy tale, is beaten and treated cruelly by her stepmother and sisters. They send her deep into the woods alone, to get rid of her. They ask her to collect for them a firelight from the old witch Baba Yaga who lives in a hut on hens’ legs and eats little children. Vasilissa finds the hut—it’s fenced by human bones and visited by strange visions. Inside, however, it is messy, full of food, and warm. Baba Yaga receives Vasilissa, and sets the girl to hard work on a long list of tasks. She labors for days, but finishes them all with the help of her magic doll. In the end, Baba Yaga gives her a gift—a skull full of embers to take with her. Vasilissa brings the fire back to her home, and the moment she walks in the door, all of her cruel family burns to ashes where they stand. Good Vasilissa buries the skull in the earth to stop further harm. Afterward, she finds herself alone in the stillness of her house, and over time, she begins to feel a desire to create something with her hands . She goes on to become a skilled weaver, and has a very happy life. Baba Yaga appears in many folktales, and in these tales she is different things. She is a menacing witch in some, and in others she is benevolent, an initiator or donor. She is a beloved figure; some see her as the memory of an ancient Mother Goddess: she encompasses both the dark and the light, destruction and creation. Have you yet met a Baba Yaga? You may not have recognized her. Or are you, dear sister, unlucky enough that no woman has ever said such a thing to you? When I was a girl, I came late and without my assignment to the classroom Joane Katsiff kept in woodsy Pennsylvania. Back then, I was scared to open my mouth in case sounds might come out. I couldn’t seem to say or do anything normal. Strange longings and excitements beat in my chest, and I stayed up all night walking in the dark, and putting my fingers into candle flames. I ate my lunch alone in a bathroom stall. I didn’t know what kind of disease I had, only that it was one of isolation. I remember the day Ms. Katsiff looked at me over her reading glasses, her black eyes twinkling and her black curls sticking out on either side of her face like soft spokes of a halo. “You’re a free spirit, Psyche,” she said. I thrilled inside. Free spirit. So that’s what I am. This Baba Yaga had looked into my eyes, and described what she saw there. No one had ever done so before in a way that did not highlight my deficiency. A free spirit is no disease—it is an earned title. It is a heritage that I was now free to claim. She named me, and what had been my curse became my blessing. In the stories, the Baba Yaga is a trickster whose chaos is telling the truth. The old witch may help us, but she also might eat us, and when we walk into her hut we do not know which she’ll choose. 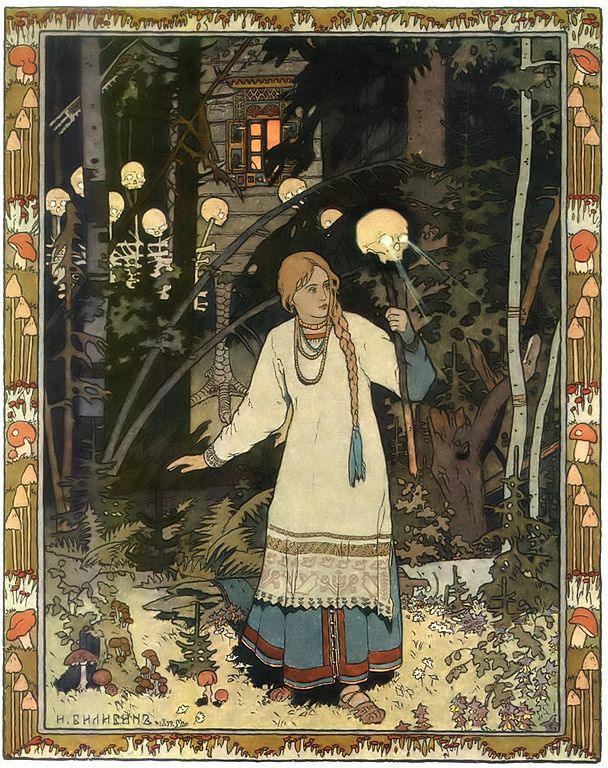 I have always seen myself as a timid Vasilissa, but now that I am a teacher, I relate more and more to the figure of Baba Yaga. A professor is in ways a Baba Yaga. Like hers, our home is full of riches, and we decide how to offer them to those who enter. Although I believe most of us are kind and generous, it is also true that at the front of the classroom we have the power to reward or punish with the A or the F. It is no surprise we are feared. When a woman comes to office hours in my classroom on hens’ legs, I have the capacity to be frightening, but also to offer a gift. Like my own Baba Yaga, I can look into that daughter’s eyes and tell her what I see there. “You are smart. You are strong. You have worked.” More than one young woman has cried when I spoke those words. She protests, and lists out all her weaknesses and mistakes. But the Baba Yaga does not act out of kindness; she is unflinching in her truth. So this is when I hand her my skull full of embers. Stern, unsmiling, I shake my head, “No. Your work is good.” This may be the first time she’s heard it. Believed it. For a young woman, this gift may be the firelight that consumes her old life and creates one new. I may notice thereafter a change in how she speaks. She’ll be too confident, the way young people ought to be. In her papers, I see she’s deleted the maybes and perhapses, and replaced them with definitely and is. I do not and do not mean to set myself apart from these young women; to be sure, inside of me still lives a Vasilissa, alone and frightened in the woods, fearful of the paths both before and behind me. But as I daily live Professor Baba Yaga, watching, and speaking the truth when I can, my own words return to me, syllable by syllable; the gifts I give rebound. In this way, I am always whispering into my own ear, “You are strong. You are smart. You have worked.” In this way, I become my Baba Yaga in the woods; I am the fairy godmother who grants my own wishes. Psyche Z. Ready can’t stop reading and writing about Folklore, Fantasy, Gender, and Women’s Literature. 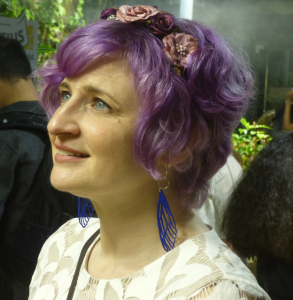 She teaches Composition at George Mason University, where she repeatedly drops her dry-erase markers and distracts herself with anecdotes about her remarkable cats. You can find her work at psychezready.com and follow her on twitter at @psycheready.